Happy Monday friends! With all the hype around the #Nsale the past few weeks I can’t help but start to think about fall fashion! One thing I can’t get enough of during the fall is all things plaid! My favorite plaid button down shirts are from Express and while it’s still too hot for boots I’ll be pairing button downs with white denim. My most used purchase from the #Nsale is definitely my BP handbag, and while the one shown is still sold out there is a handbag that is almost identical for under $25! LOVE this outfit! I love plaid in the fall too! This outfit is so simple yet chic! I love your flats too! This is such a pretty plaid! Yesssss!!! Bring on fall and plaid shorts! Love it with the white denim! Love the color combo. So chic for fall! Love this casual look! I’d rock this all fall long! A great fall preview outfit!! 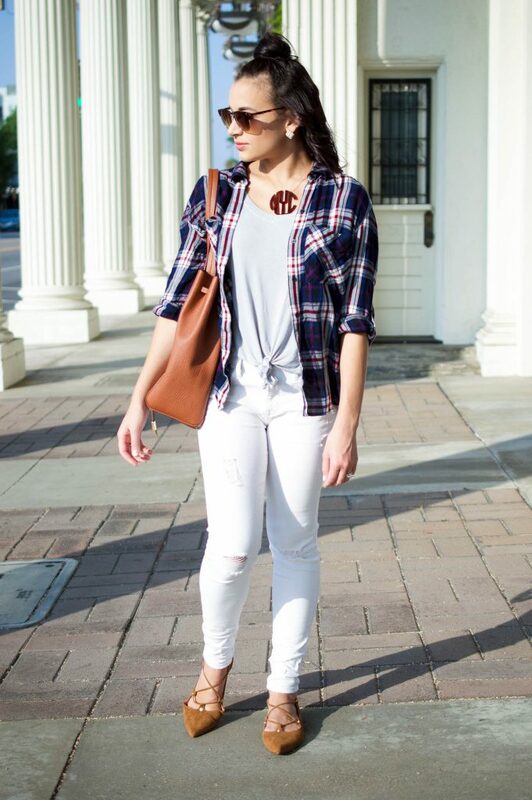 Fun way to wear plaid. Love your shoes, I got them in the blush color during the #NSale. I love this look! 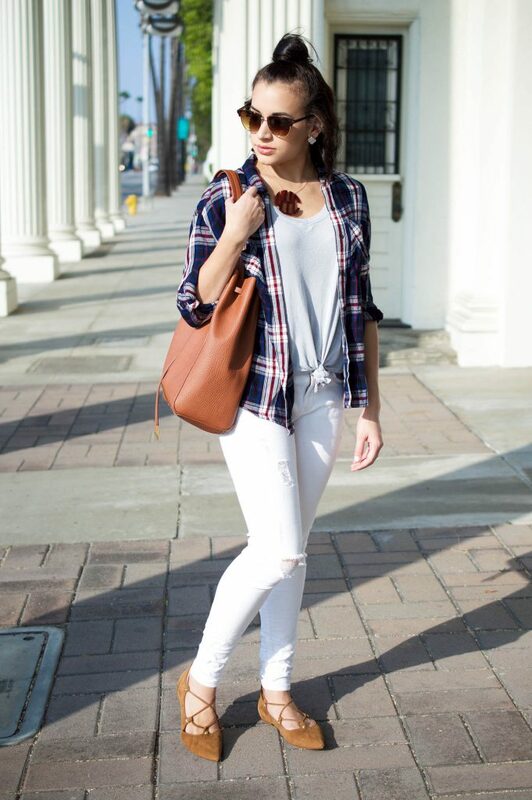 The all white in combo with the plaid is a perfect transition outfit! I agree #nsale hype was major this year and now all I want to do is wear fall clothes! I love this look!! Some of my favorite nsale picks!! Oooh! Love the white jeans! I had a pair from Ann Taylor and put them in the wash and it ruined them with weird stains everywhere. These are cute! you could totally take this into the fall. The whole look. Such a classic outfit! 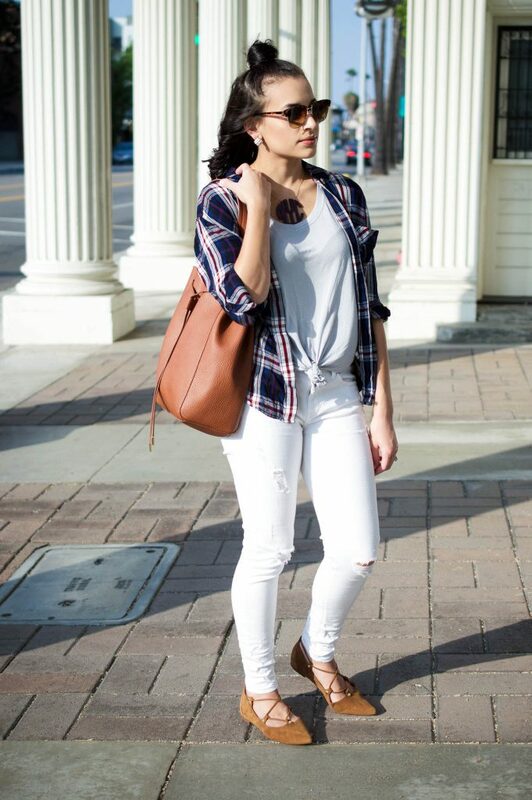 You can never go wrong with white jeans, a grey tee and plaid. I love the plaid shirt with the white pants. Cute look! Love your necklace and those flats! Love the combo! That bag is wonderful too! Such a great casual look! Love your hair too! I need to get a pair of white jeans, they are so versatile! Such a great look! You look fab. I also bought those shoes & bag. There were so many good deals! This is such a cute look! I really love your shoes! Love your bag! Kicking myself that I didn’t get it during the #Nsale! Love this casual cool outfit! Found your blog from A Good Hue. You have great style and hope to see you stop by mine tonite! Love this look, so cute and perf for the transition time! Classic and chic! Love this look…. totally perfect!! The little knot on your top is too cute! 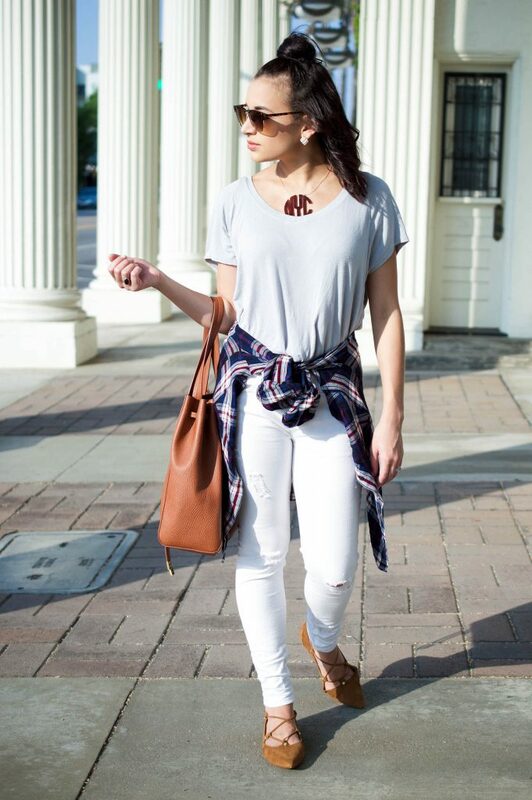 such a cute way to style this look! 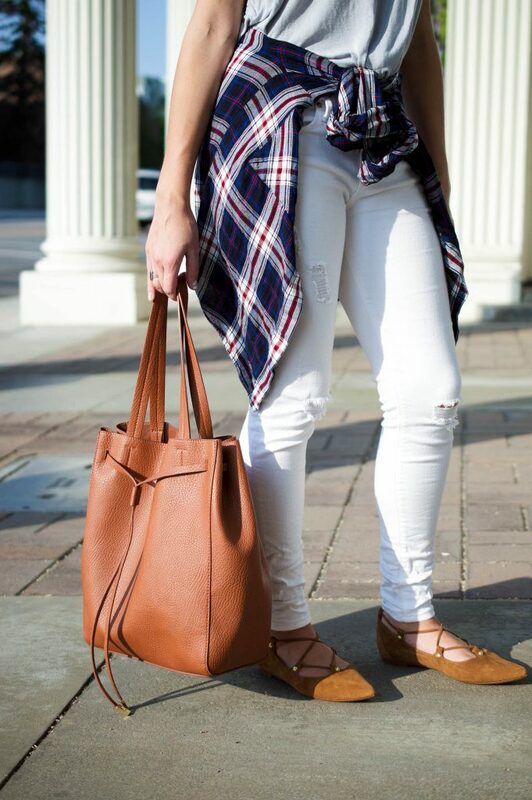 White jeans are so amazing and versatile for any outfit! Those lace up ballet flats are fabulous!